I am not scared of the idea of hell, because I've lived one for first 27 years of my life. As many times lately, I've been taking the bus, it can open quite a few eyes to travel in the mass transportation system and look what people are doing, as well listen to. There is a fine line between finding a system of faith that can compliment an ideology, and being harassed by almost everyone that is obsessed on proselytizing their faith; because at the end, faith is just a mere business for the pastor. Look at Joel Osteen or Joyce Meyer, they don't live the humbleness they profess but their sects they have to. As I went in the bus, being stubborn and quick to react, I rarely accept anything from strangers, but yesterday I saw something it got my attention. 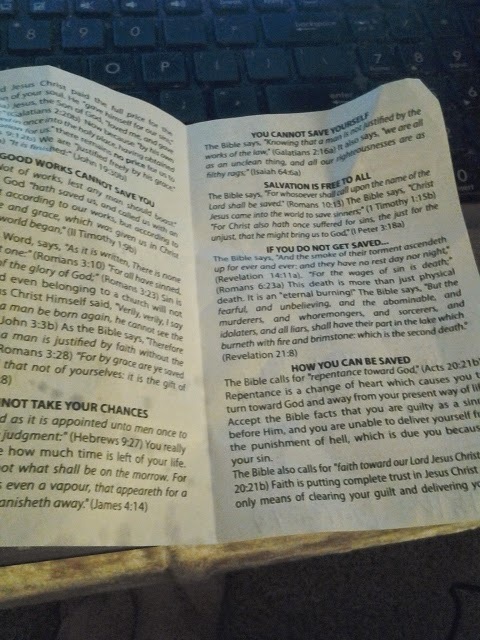 The little pamphlet that is on the left side of the entry. As I walked by, the person who offered the pamphlet was an African American guy, he was sitting alone on the fourth seat. He was sporting a red polo with white stripes, and he had an impeccable haircut, but he was in complete silent. I couldn't avoid taking the flyer because that way, it would let me to study him from the distance and eventually to took a few videos about the different people he tried to approach. Nobody after me really accepted the little piece of paper, but then I have a morbid fascination on studying people as I mentioned previously. Is an old habit since my days of journalism that I still keep; the guy had several pamphlets as well several buses routes. I would believe in the ecclesiastical term, he was a missionary, or at least a volunteer with nothing better to do on his day off in order to fulfill his quota of "saved souls." After a few last tries, the guy stop not far away from my house at Anderson Rd, and I assumed he took bus seven to go south to Hillsborough Avenue, in order to go to his church. Later we are going to examine the science of "saving" and how the different sects approach the people through this form of privacy and personal invasion. As you can see the video is upside down, I apologize but I do not have any video editors at the moment and I don't feel to invest some effort to upload it on a laptop that is essentially dying. As you see in the video, a woman with red hair goes in, and walks behind, she eventually pass the guy I mentioned earlier and she says no. She sat behind him, and he tried several times to keep talking to her. Because, it is "important" to save people from something much of them don't believe on the same semiotic message as the sender of the message. It brings me to the next question, and if any of my friends read me, I hope an answer "Why is so important to spread your message.? While in the process you can offend someone who is happy with the way they are." Why the obsession to live in close such proximity, almost and not to say a fanatical level of a book that is extremely outdated by this millennium.? As well, claiming that every single church, spawn from one obscure one, that almost was "cloned" with Photoshop from another one, to say that the church is the true church and then ridicule any other faith.? Is almost childish, because Christianity as is today, with all those church that say that are the true church of God are just a mere offspring of Catholicism, and even so Catholicism itself has some obscure origin on a letter written by Ignatius of Antioch around on AD 107, and yet all this comes from a separatist Jew that was competing with other "Messiahs" in order to find his place on the convulsed times of the Roman Empire, and even so it wasn't until the year 313, through the Edict of Thessalonica that made the Catholic Christianity the official religion of the Empire. Yet, we could be adoring Mithra or any other Gods if it wasn't for the Romans; and, we are not going to go with the Greeks because they turned everything more confusing due the poor translation they made of the old papyrus. Free thinking and free speech are two components that don't go well with religion; because, if the followers start questioning, they are committing the ultimate sin, questioning the authority; but, what really gets my attention around the pamphlet it is the way that is divided. As many charismatic sects, Neo Pentecostals and sects that were on the Second Awakening; they made their effort to reach the people who have doubts with their own life, or youth at risk. The way that we see how some religious sect approach individuals, though spreading the good news, are in the hands of the Jehovah's Witnesses, the invention is relative new, as they tried to summarize their tenements in a simple way to spark the curiosity of the people and bring them in, into their religion. Mass media itself played an important role, as in the 1900's revivals, preachers used radios and prints in order to bring people to their congregation, as of today they use Social Media such as Facebook and Twitter, and it proves that is good for the business as they can capitalize their web success through add-on and add-words to bring some extra but substantial revenue. The little handbook could be itemized as the only way to salvation is to reject yourself, where you have to reject your life and accept you are sinner and the teachings of the preacher can save you. Free will it is the ultimate sin to whoever dares to reject any form of authority, not only religious, but towards the establishment order. 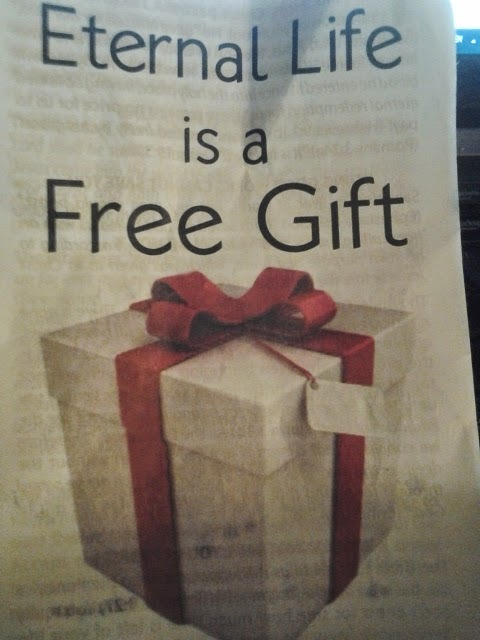 And to the man who gave me the pamphlet on the bus, he was from the West Gate Baptist Church; but, this is not the first time I've had encounters where my privacy feels violated, not only by the West Gate Baptist Church but also by several others. Not only at the bus, but at the place I am working in right now. It can be annoying when freedom of religion is contradicted within himself and let the freedom of expression be diminished. We are on the point that we are living more on a theocracy (at least in the South), and it's been given to the point that is OK to proselytize instead of supporting civil rights. Who knows knows,? but a ride in the bus, you can always learn something about people and how the interact with their surroundings.